Winches are coated with an oven cured epoxy that outlasts a conventional finish. It provides an extremely tough, durable finish with resistance to rust, salt, spray chemical erosion, general weathering, abrasion and impact. These winches are part of a complete range designed for agricultural and light duty applications. These models have large 50mm diameter drums to allow cable to wrap evenly without kinking. 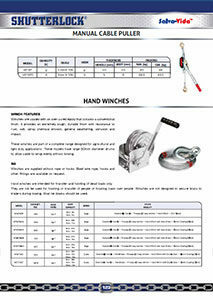 Winches are supplied without rope or hooks. Steel wire rope, hooks and other fittings are available on request. 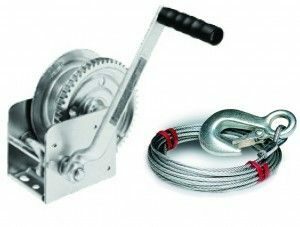 Hand winches are intended for transfer and hoisting of dead loads only. They are not be used for hoisting or transfer of people or hoisting loads over people. Winches are not designed to secure boats to trailers during towing. Boat tie downs should be used.